Win a share of £10,000 in the Money Maker Promotion at BGO Casino this January! 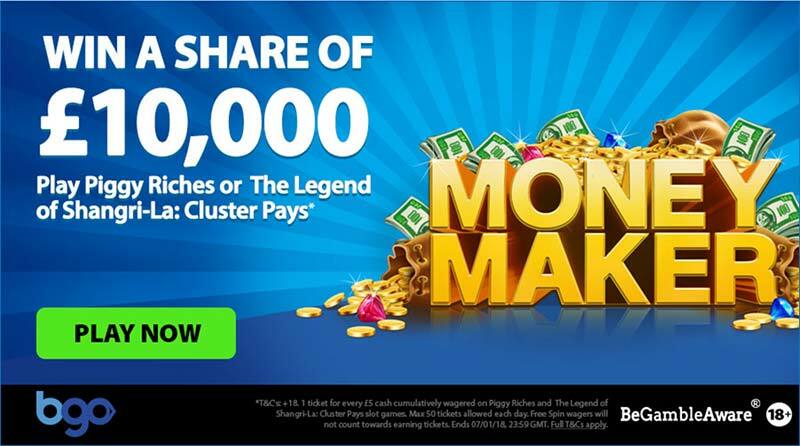 BGO Casino has just launched a very nice promotion to kick off the new year, the Money Maker promotion has a prize pool of £10,000 in cash prizes, and only runs for the next few days. Taking part is incredibly easy, you simply need to be playing either Shangri La – Cluster Pays or the classic Piggy Riches Slot, you will earn 1 raffle ticket entry for every £5 you wager with real money on these slots with a maximum of 50 tickets to be earned each day (200 in total). The promotion runs from the 4th January until Sunday 7th January 2018 with the prize draw taking place on the 8th January 2018. There are already several other great promotions running already at BGO Casino so make sure to check through the promotions section. £10,000 Cash Prize Giveaway, earn tickets by playing specific NetEnt Slots. Earn raffle tickets for every £5 wagered on these slots. Promotion runs from the 4th January until the 7th. Top Prize is £2000 in Cash. Full Terms and Conditions are listed in the BGO Casino Promotions Section (Money Maker). There are prizes for 500 lucky players up for grabs with a top prize of £2000 in cash.